It is our vision that in partnership with parents and the parish community, Assumption of the Blessed Virgin Mary School provides a quality Catholic education that lays the foundation for a life-long commitment of service and participation in our faith and an academically enriched experience that prepares students for the challenges of the future. For the past 15 years, we have been guided by a Strategic Plan which has lead to the success of our school academically, financially and allowed us to enhance our infrastructure to support the technology used to support the learning process. 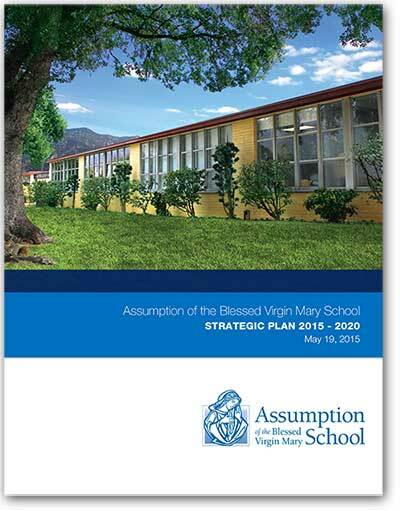 Through community surveys, focus groups, planning retreats, and more, we have engaged our stakeholders – students, parents, the parish, teachers, and staff – refined our objectives and continued our five-year strategic planning process. We are pleased with the progress we have made thus far, and excited about the future – of our School, our parish community, and, most importantly, the students who daily bring to us their limitless potential.